I love cereal, always have, always will regardless of all the carbs people complain that it has. Its hands down one of my favorite foods! However, there are some cereals that are awful for you and should be avoided at all costs and some, like the ones I eat that have Omega 3’s, fiber and protein in them. Anything with some sort of candy in the cereals name should be avoided such as Reese Peanut Butter Puff Cereal that has a whooping 12 grams of sugar and 3 grams of fat per ¾ cup serving. Also, think of the word frosted as covered in sugar and avoid it! Most typical kid’s cereals should also be avoided because of their high sugar content that will leave you hungry in a few short hours. Some examples are fruit loops, cocoa puffs, smorz cereal and frosted flakes. Now that we have looked at some cereals to avoid there are a number of cereals out there that have great, heart healthy ingredients! 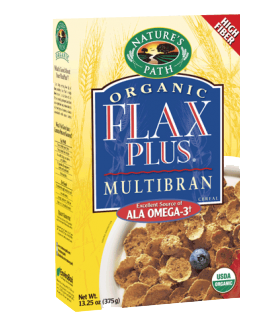 One of my personal favorites is Nature’s Path Organic Flax Plus Multibran with Omega-3’s. Long name I know but the ingredients in here make it a great choice for the morning. First, it has only 110 calories and 1.5 grams of fat per serving. Also, I only has 4 grams of sugar and contains 5 grams of fiber and 4 grams of protein. There are also no trans fats and this cereal is made of all whole grains. Another choice I really like is Kashi Go Lean Original because of the high amount of protein and fiber it contains. Just one serving has 40% of you daily-recommended fiber at 10 grams and 20% of your recommended daily protein at 13grams. Also it has only 140 calories for a full cup! Finally, the other cereal that I really like in the morning is Special K Protein Plus. In ¾ of a cup (1 serving) you get 10g of protein, 5g of fiber, 9% of your total potassium for the day, along with a long list of vitamins and minerals including zinc, folic acid, selenium, and niacin to just name a few! There are 3 grams of fat but only 100 calories in the serving and it along with the other cereals mentioned really helps to keep you full throughout the morning. All of these above mentioned cereals are great but I like to jazz them up for flavor. I add blueberries to my morning cereal because they are rich in vitamin c, manganese, and high in antioxidants, which work to neutralize free radicals in the body (free radicals are linked to cardiovascular disease and cancer). I also throw in some dried gogi berries, which are known for their anti-aging properties because they are high in antioxidants and marketers of gogi berries claim they improve circulation and reduce inflammation. I also always make sure to add some flax seed to my cereal. First, you can not even taste it and it adds more fiber and omega 3’s to the cereal. Omega 3’s are “good” fats that are important for heart and circulatory health. So choose your cereals wisely and load them up with super fruits for their antioxidant benefits. You will stay full longer, which will help your waistline and the antioxidants, omegas and fiber will do wonders for the rest of your body!